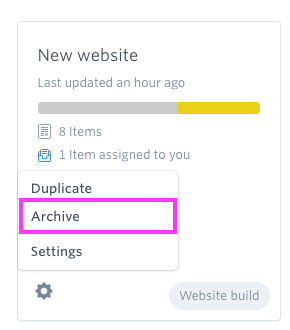 If you're no longer working on a project and want to remove it you can either ‘archive’ or ‘delete’ the project. If you are no longer working on a project and want to remove it, or don’t want it to affect your project quota (the amount of projects you are permitted by your subscription), you can either ‘archive’ or ‘delete’ the project. If you want to permanently delete a project from your account: completely removing all of its content, files, assignments, and details from our servers, then you can choose to delete your project. If you just want to get a project out of the way, but want to maintain the ability to reactivate it at any time, then you can archive a project. Archiving a project will remove it from your dashboard, and will stop it from affecting your project quota, but its content will remain safe and backed up. You can choose to reactivate an archived project at any time. By doing so it will start to count towards your quota again. You can follow these steps to archive and delete a project. Click the GatherContent logo at the top of the page to get here. Click the Settings cog on the project you want to archive. Click 'Archive'. To delete a project, you need to use the method as described here. If you've already archived the project, you should restore it and then use this method to delete it. Click the Settings tab. You'll find various options for your project here. Choose to Delete or Archive your project. This change will take effect immediately. Remember; deleting your project CANNOT be undone. Tip: You can restore an archived project at any time. To do this, go to your Account settings and open the Archived projects tab. This is where you can browse and restore your archived projects.